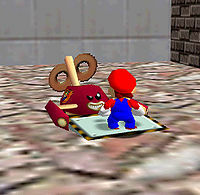 Heave-Hos are red mechanical enemies in Super Mario 64 and Super Mario 64 DS. They appear in Tick Tock Clock and Wet-Dry World. Their faces resemble those of an Amp. Heave-Hos cannot be destroyed. They ride on three wheels, and have a dustpan-like mechanism with footprints on it, which they use to fling Mario upwards. On the Heave-Hos' sides are emblems of Bowser giving a thumbs up, which is over the word "KOOPA" written around in fire. After moving around their area, they lose power, and they have to wind up the key-like object in their backs, much like a toy. Heave-Hos can help Mario by flinging him upwards depending on the direction they are facing to help him reach higher areas. However, one wrong move can cause Mario and the gang to take fall damage or even get flung into a pit. They will disappear if the water level is too high for the platforms they are located on. Once the water is drained, the Heave-Hos will reappear on their respective platforms. 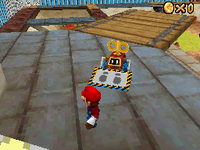 In Super Mario 64 DS, Heave-Hos have undergone multiple visual changes, having eyes inside visors instead of a face. The "KOOPA" emblem is gone from their texture. Besides appearing in the aforementioned worlds, they also appear in the Battle Fort stage. Popoi From poi, a colloquial word meaning "to throw away". See Cataquack as written in Trivia. It is possible to obtain the "Get a Hand" star in Tick Tock Clock by stepping on a Heave-Ho at an angle where it directly flings the character into the star. The Cataquack, an enemy appearing in Super Mario Sunshine and later games, behaves similarly to Heave-Ho. Both enemies use flat surfaces protruding from their bodies to launch Mario high into the air. When moving, they make the sound of a working machine, similar to the Chuckya. In the Japanese version only, getting flung by a Heave-Ho exclusively triggers the damage process upon landing even if no damage is actually taken. In international versions, if no damage is taken, Mario makes the same sound he makes if hit by a Koopa Troopa, and he does not flash upon getting back on his feet.